It seems many people in my neighborhood like to compete with each other when it comes to Christmas lighting. Now, not like on National Lampoon’s Christmas Vacation, but everyone wants to stand out with something different. But how can you make your Grand Rapids home stand out next to all the other homes in the neighborhood this holiday season? When the holiday season starts rolling around and your neighbors are having their Christmas lights installed by a professional, what color do you see a lot of? We can bet you see a lot of home with warm white lighting! 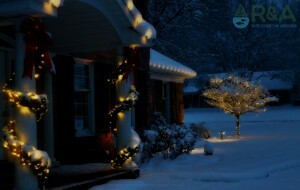 Warm white Christmas lighting always looks classic, tasteful and elegant, so it’s always a popular choice. If you find your Grand Rapids home in a sea of white Christmas lights here are some ideas to stand out. Add Some Color – You can still use the warm white, but alternate in red, green, or blue bulbs…something to change up your roof line. The alternating bulb look will have your house blending in with neighbors but standing out at the same time. Ditch The White – Not feeling the warm white look? Then ditch it, and use all color. 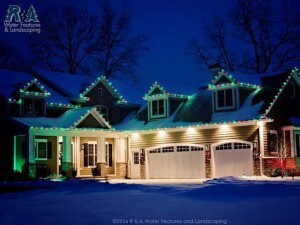 You don’t have to use the typical multi lights if you don’t want to, you can use one color (a roof line in all green might look pretty cool), alternate between two colors (red and green are great festive colors), or pick three colors (alternate the three, or dedicate each color to a different component). It seems like we always suggest greenery, but it really is one of the best items you can add to your Grand Rapids Christmas display! Why? Daytime – Most people leave their Christmas lights off during the daytime, so what makes a house look festive for the holidays during the daytime? GREENERY! Wreaths, column drops, garland…each of these items add that extra ‘je ne sais quoi’ to all holiday decoration displays, especially in the daytime! Bows – Our greenery is pre-lit and come with gold-trimmed red bows. So not only will you’re pre-lit greenery make your Grand Rapids home look warm and inviting at night but the green of the garland (or wreath) paired with the vibrant red and gold of the bows really pop against a white backdrop of snow…making your home really stand out, day or night! With professional Christmas lighting, installed by R&A Holiday Decoration, you are able to have the customization you are looking for to get your Grand Rapids home to stand out against the rest. Whether you’re looking for the classic warm white Christmas lighting for your home, maybe adding a splash of color or two, animated lighting, greenery, or other holiday decorating components, we can help you out. And don’t worry about hanging, taking down, or storing your Christmas lights because we will take care of that too! And did we mention, you won’t be ‘renting’ your Christmas lights (like you do at those other places), every component you choose through us, you own! Get started with your holiday decorations today by contacting us, and be sure to check out recent Christmas lighting projects we have completed in Kalamazoo and Grand Rapids!